The church cemetery was founded shortly after the establishment of the church in McClellandtown and has been providing burial sites to the community since the early 1840's. Information about purchasing a burial lot is listed below. 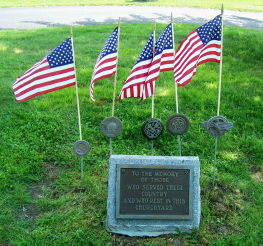 Some additional photos of the cemetery are located at the page for photos from the May 22 Clean-Up Day when students from the Jr. ROTC program at Albert Gallatin High School came to replace flags and flag markers for veterans and help to prepare the cemetery for the Memorial Day Weekend. If you are looking for a member of your family who might be buried in the church cemetery, so burial records and photos of grave markers might be found through Find a Grave. Below is a search box for Find a Grave and you can search by family surname. The McClellandtown Presbyterian Church Cemetery, which is also known in the community as Church Hill Cemetery. The cemetery is owned and operated by the church. The church manages cemetery operations through an endowment fund established from funds received in the sales of burial sites to insure its perpetual care. The McClellandtown Presbyterian Church Cemetery is not just a church cemetery but throughout its history has operated as a community cemetery and individuals in the community can purchase burial sites for themselves and family members. Burial sites are $400.00 per burial lot with a two lot minimum for purchase. The church is in the process of expanding the size of the cemetery and new burial sites will become available in the next several months, though there are many existing sites to select from currently. A limited number of single burial sites are available in specific locations within the cemetery, please call or fill out the form below for additional information. Cost for opening and closing a grave is $550.00. If you are interested in purchasing a burial lot in the cemetery. You may call the church at 724-737-5585 and leave a message if we are not available and we will return your call as soon as possible. You would like to purchase a burial site or receive additional information or ask any questions, please fill out the form below with your contact information. We will get back to you with information to help you in reaching a decision about purchasing available burial sites. You need to check one of the options below. Leave any additional comments that will help us to better respond to your questions.